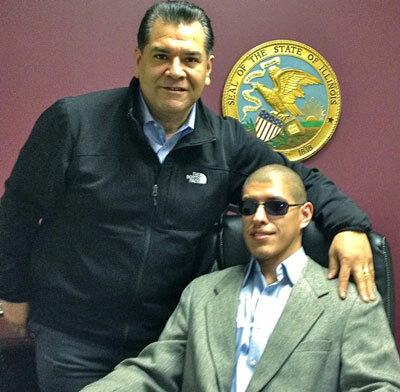 Cicero, Illinois – State Senator Martin Sandoval (D-11) met with Gerardo Salinas to discuss policy for people with disabilities in the State of Illinois. Salinas lost his vision when he was 12 and since then has worked to succeed in many ways, including moving to the United States from Mexico and recently graduating with honors from Daley Community College. “I applaud Gerardo for his determination to succeed and his willingness to give back,” said Senator Sandoval. "I refuse to let my disability hold me back,” said Salinas. “I want to work with my senator to help create laws that would facilitate living with a disability." Salinas plans on continuing his education, working towards a bachelors degree in political science before attending law school. Cicero, Illinois – Leaders of The World Mission Society Church of God drove from Naperville to visit State Senator Martin Sandoval to personally thank him for his service to the people of Illinois. The Church of God prides itself for ‘bringing happiness to the world’ through their volunteer services, which include performing environmental cleanups, disaster relief, blood drives and community support. Senator Sandoval represents the 11th Senate District, which includes the neighborhoods of Brighton Park, Clearing, Gage Park, Garfield Ridge, Little Village, West Lawn, and West Cook municipalities of Bedford Park, Burbank, Cicero, Forest View, Lyons, McCook, Stickney, Summit and Riverside.